Samsung is preparing to give the original Galaxy Note some much-needed tender, love and care with the introduction of a Premium Suite upgrade. Along with the refreshed Jelly Bean UI, Samsung will add Multi-Window support, Popup Note/Video/Browser, Photo Note/Photo Frame, Easy Clip, Paper Artist, Handwriting on S Planner/Email, Enhanced S Note, and along with Jelly Bean comes Google Now support. The Premium Suite upgrade truly lives up to a name as this update will breathe new life into the first generation Note that spawned its larger, and incredibly popular successor. There’s no word on when or if the Premium Suite will land on T-Mobile, but with Samsung already releasing official info with what’s on board — it won’t to long before we see some concrete info on availability. In the event the Premium Suite doesn’t officially land on T-Mobile, you can rest comfortably that the folks at XDA will be on top of bringing it to every original Galaxy Note worldwide. Hit the Samsung link for the full Premium Suite breakdown. Why? The Galaxy Note released internationally in 2011 and the next iteration usually follows the next year. If that happened we would be getting into the debate of how intl. versions of phones get released a year before we get them…again. I’m glad we could finally get that debate over with with the simultaneous releases of the GN2 and GS3 in the US. Does any think the Sll would be capable of running some of these premium abilities? If I were closer to a contract renewal I would consider it. I’ve messed my Mt4G slide and can’t figure out how to unbrick it. Can’t risk that with this phone. 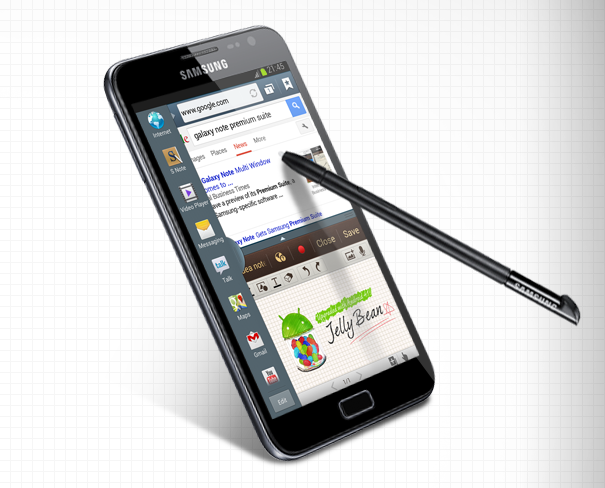 It will be nice to see the original Galaxy Note get some love. Did you just compare a phone with no inductive stylus, only 480 lines of resolution, and 30% less screen area with the Galaxy Note? So this shipped with gingerbread , then got ice cream sandwich. Although the T-Mobile variant came with this preloaded. Now it gets jelly bean too… The mobile market is becoming saturated. Unless you have something that is completely innovative and foundation setting I don’t see the need to compete using the same or similar tools. The reason the iPhone took off is because it created an isotope and something revolutionary at a time when touch screens were resistive and not popularized. While not the first capacitive touch screen I believe it for sure was the first main stream. Apple has success because they haven’t strayed from this design. Manufacturers copied and imitated versus innovate however larger screens and unique input methods have come about, innovation really hasn’t been present. Aside from device performance, camera megapixel, lock screen, apps, etc. It’s all pretty much similar if not the same…. OMG…. Did u know that the Note2 does not support Google Wallet?